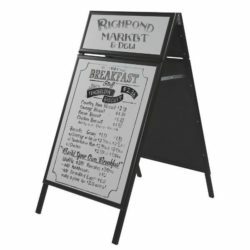 Overall Size: 31.01" x 37.01" x 55.51"
Packing Size: 34.25" x 57.48" x 4.53"
This heavy duty pavement sign is a perfect use for displaying posters and advertising signs with your own logo. 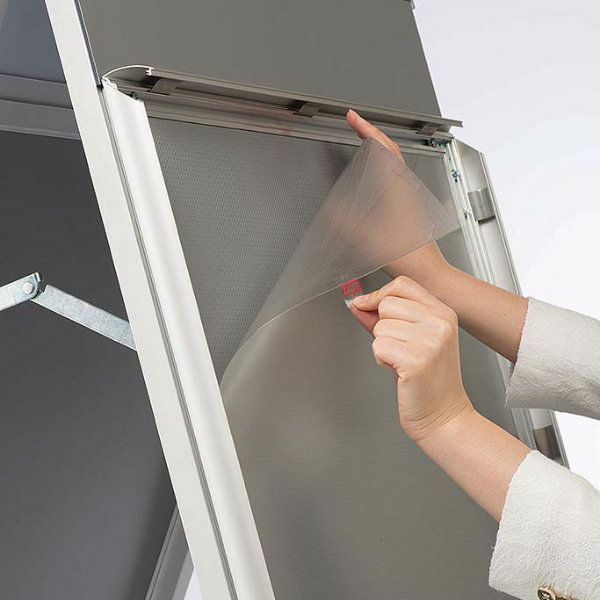 Provides practical use, quick change-poster and logo. 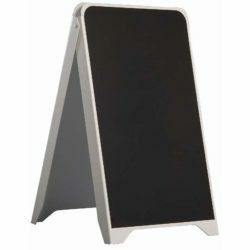 The replaceable composite plate is an ideal spot for a logo or a permanent message, suitable for outdoor conditions. You can print your logo directly or laminate on aluminum composite plate. 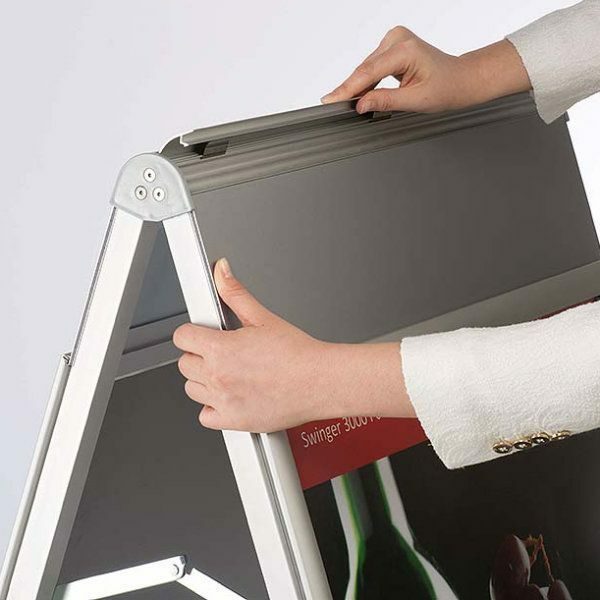 The frame is hinged for easy transport and storage, with a locking stay to secure when open. How do you convince the passersby to go in your store! Of course by presenting your product and your offer in a right way. No matter you are running a restaurant, a retail shop, a bar, a bakery, a hotel or any kind of facility, how do you do that? One way is using outdoor signs to display your offer in front of your facility. 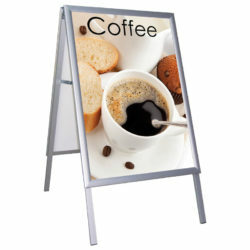 These portable signs are perfect to display the ongoing promotion and refresh when the deal changes. 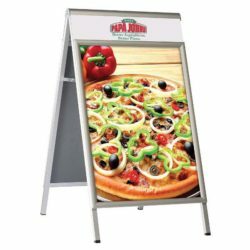 It is not wrong to call these signs as business signs because you can also publicize the upcoming events, current sales, menu items or any kind of information you want to give. 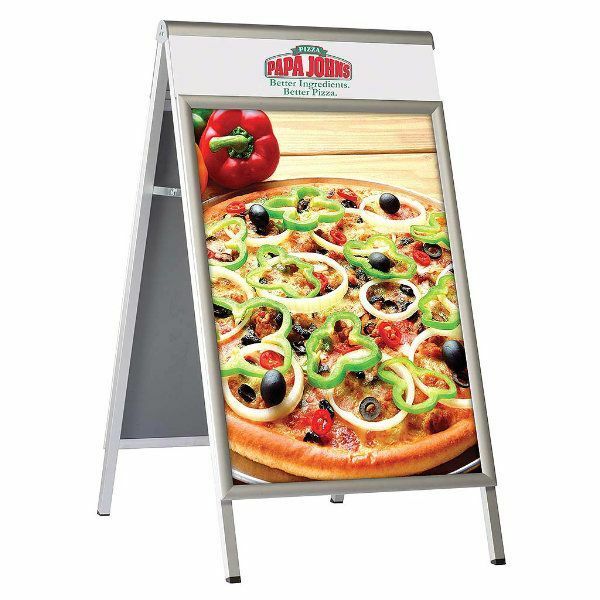 One of the most important features of these pavement signs is that they are double-sided, so people coming from each direction can see your advertisement easily. 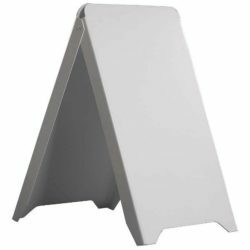 These A-frame signs come in asoft gray color, standard in silver anodised, and has a header area of aluminum boards to display your logo, a short catchphrase or simple greetings, printed with adhesive-backed vinyl. 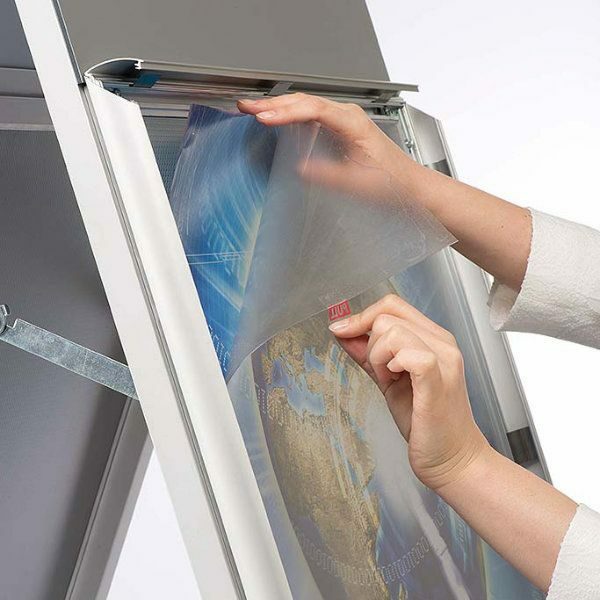 Below it you can put full-color, custom-printed posters. 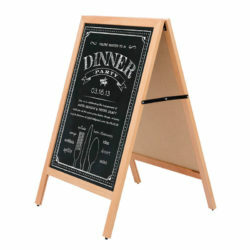 It is a double sided sidewalk sign. 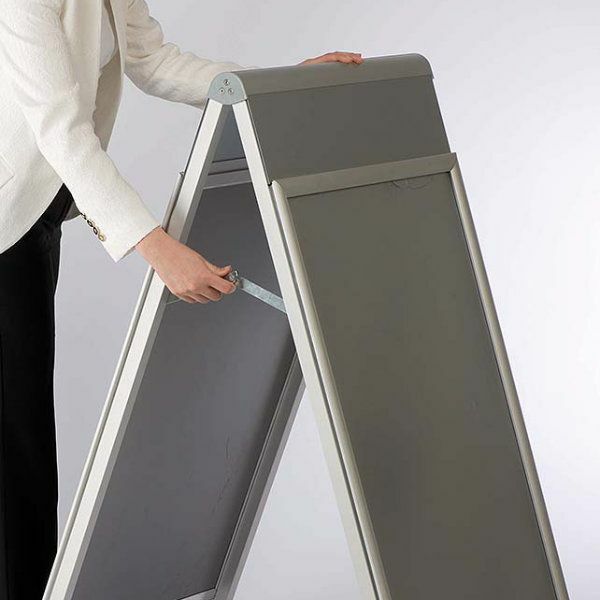 The sandwich board is opened and closed by the two metal hinges at both sides. 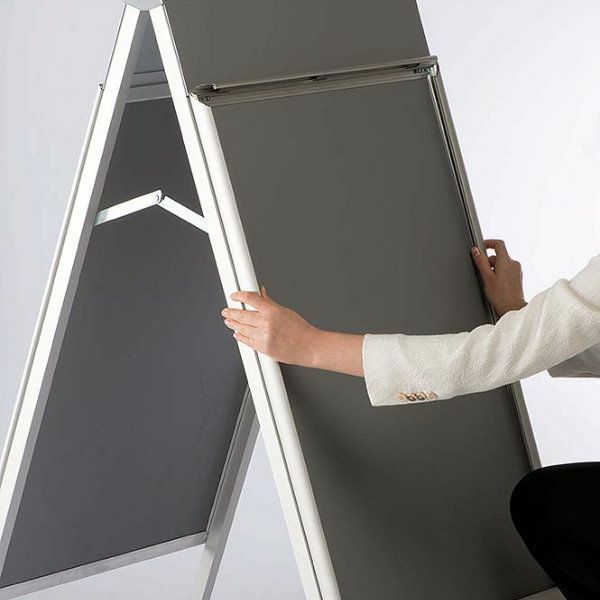 To store or transport the signage, you just fold the a-frame together. 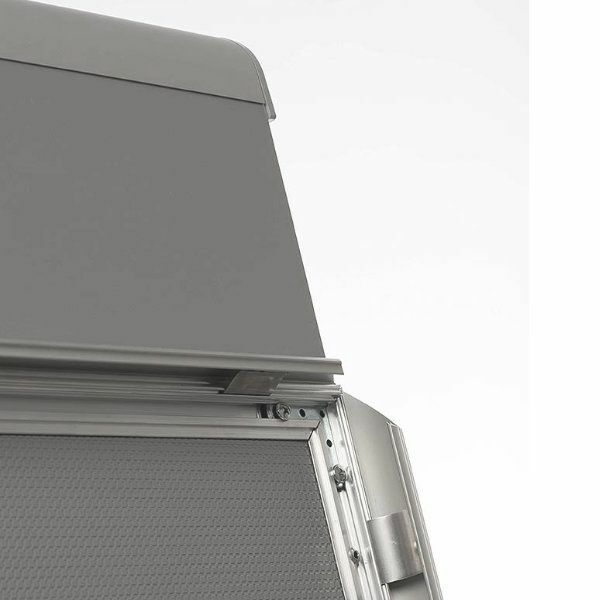 Heavy steel back panel on both sides provides stability in windy outdoor conditions. 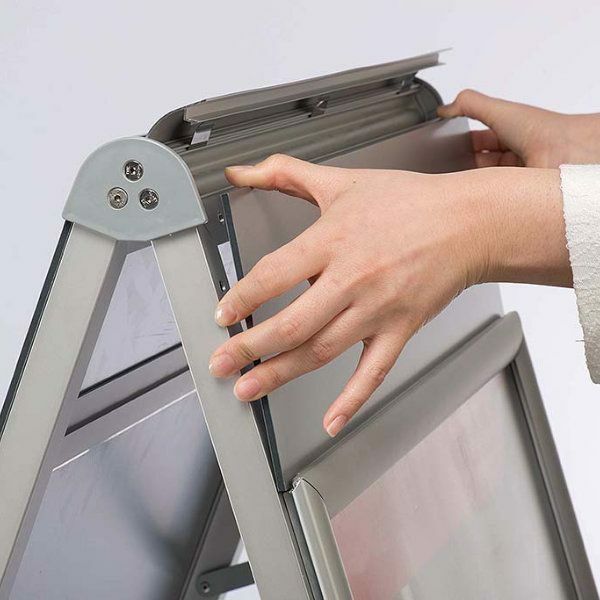 Each unit has drainage holes on bottom profiles to allow the rain to leak out of the snap open frames. Great product, highly recommend. Very sturdy and well-built. Easy to use.